As Lillian, a one-hundred-year-old African American woman, makes a “long haul up a steep hill” to her polling place, she sees more than trees and sky—she sees her family’s history. She sees the passage of the Fifteenth Amendment and her great-grandfather voting for the first time. She sees her parents trying to register to vote. And she sees herself marching in a protest from Selma to Montgomery. 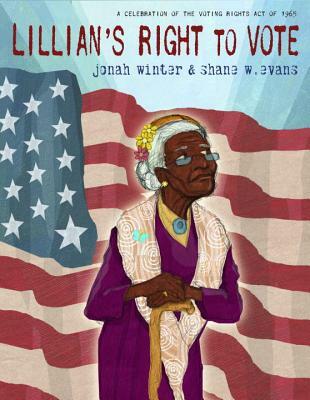 Veteran bestselling picture-book author Jonah Winter and Coretta Scott King Illustrator Award winner Shane W. Evans vividly recall America’s battle for civil rights in this lyrical, poignant account of one woman’s fierce determination to make it up the hill and make her voice heard. Jonah Winter has written many highly acclaimed books for children, including You Never Heard of Sandy Koufax? !, which was named an ALA-ALSC Notable Children’s Book and a Booklist Top of the List, and You Never Heard of Willie Mays? !, which received four starred reviews and was named a Bulletin Blue Ribbon Book. His other books include Here Comes the Garbage Barge!, a New York Times Best Illustrated Book; Barack, a New York Times bestseller; and Dizzy, recipient of Best Book of the Year citations from Booklist, School Library Journal, The Horn Book Magazine, The Bulletin, and Kirkus Reviews. Jonah divides his time between Santa Fe, New Mexico, and a small town in Pennsylvania. Shane W. Evans is the author and illustrator of numerous books for children, including We March and Underground: Finding the Light to Freedom, which received the Coretta Scott King Illustration Award. He has illustrated more than thirty picture books, including Osceola: Memories of a Sharecropper’s Daughter by Alan Govenar, winner of the Boston Globe–Horn Book Award for Nonfiction. Shane lives in Kansas City, Missouri, where he runs Dream Studio, a community art space.